Instant Pot Italian Meatball Soup is easily made in the Instant Pot, with accessible ingredients and in just 30 minutes. 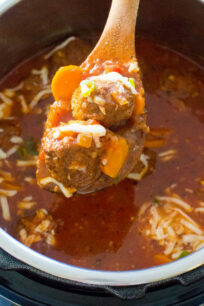 Juicy and delicious meatballs cooked in a rich tomato broth. 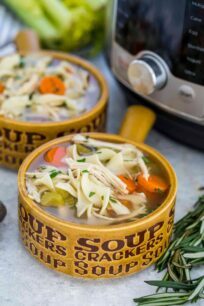 Instant Pot Italian Soup is my definition of pure comfort food. All you need is a warm bowl of it, some crusty bread, and a comfy blanket. If you are a huge fan of Instant Pot recipes just like we are, you will love Instant Pot Mongolian Chicken, Instant Pot Orange Chicken, and Instant Pot Tomato Soup. Instant Pot Italian Meatball Soup is the perfect easy meal you can put on the table in 30 minutes or less. 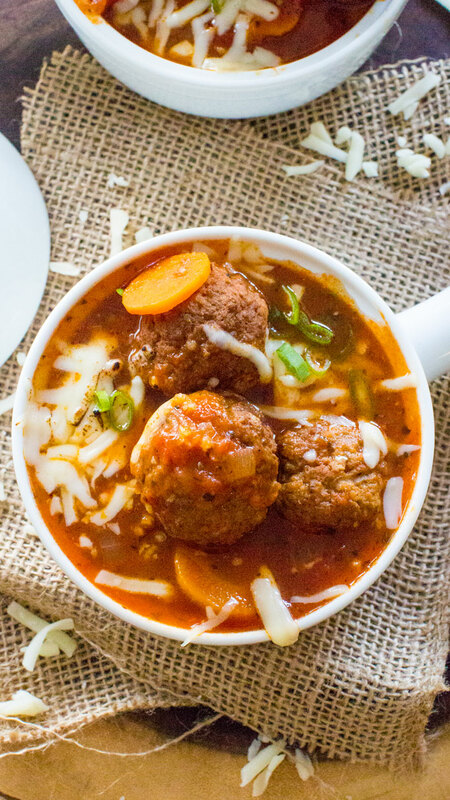 With budget friendly ingredients and thanks to using frozen, store-bought meatballs, this delicious soup is easy breezy to make. Made with juicy meatballs, marinara sauce, crushed tomatoes and topped with cheese, this meal is pure comfort food. Instant Pot Italian Meatball Soup is best served with fresh, crusty bread, and use lots of it for dipping into the soul warming tomato broth. Firstly, I prefer to use frozen fully cooked meatballs, because they already have a nice golden-brown color. In addition, I kept the vegetables to the minimum in this soup, because I wanted a rich tomato broth. You can add 1 cup of celery or 3 potatoes. Also, beans are a great addition too. You can add a can of cannellini beans. Make sure you rinse the beans before adding them to the pot. You should taste and adjust for salt, pepper and spiciness. How to freeze the Instant Pot Meatball Soup? I recommend using quart bags for this soup. Use a cup to transfer the soup from the pot into the bag. Then, squeeze out excess air and seal the bags. The bags can nicely be stored in the freezer for up to 3-4 months. 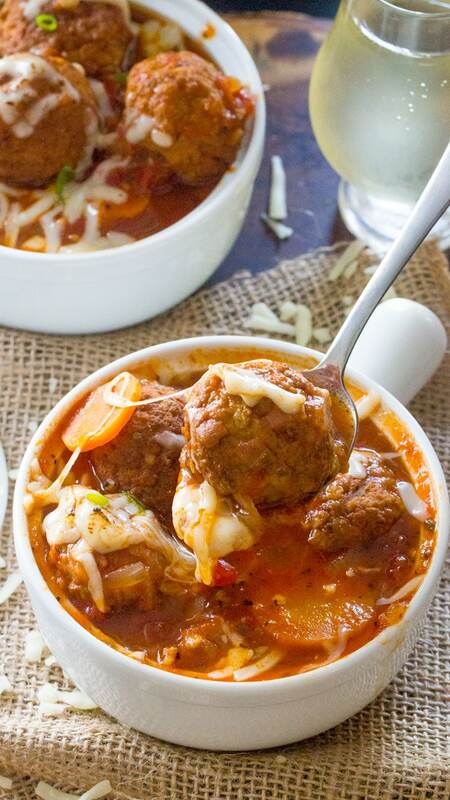 Instant Pot Italian Meatball Soup is easily made in one pot in your Instant Pot, with accessible ingredients and in just 30 minutes. 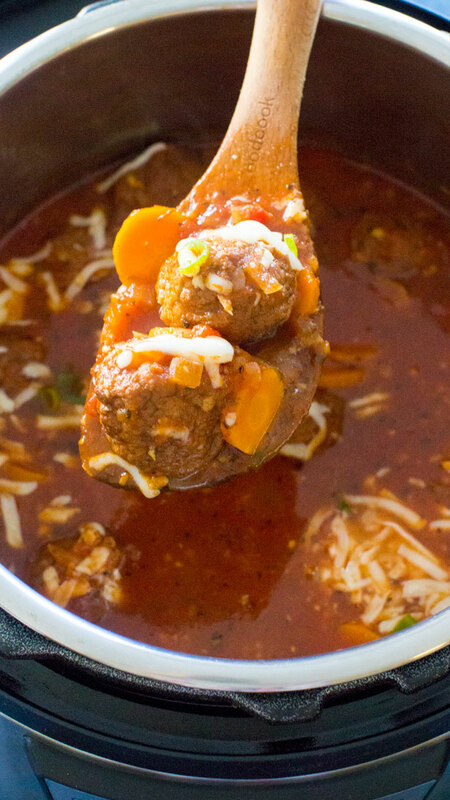 Juicy meatballs cooked in a rich tomato broth. Add the oil to the hot Instant Pot, add the diced onions and minced garlic, and sauté for 2-3 minutes, stirring a few times. Add the carrots (plus celery if using) and cook for 1 minutes. Add the tomato paste and cook for another minute. Add the rest of the ingredients to the Instant Pot, except those listed in the "Garnish" section. Stir. Using manual function, set to high pressure for 9 minutes . After 9 minutes, use quick release. Stir. Serve topped with scallions, parsley and mozzarella cheese. Serve with crusty, warm bread on the side or grilled cheese. I think I’ve just found my motivation to get my instant pot back out and put into use. This looks awesome and I know my boys will love it! 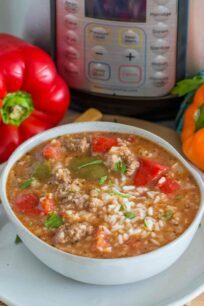 I love using my instant pot, and this soup looks amazing! This looks so good! I have to get an Instant Pot now! What a great soup recipe! I need to try it out! If I add cabbage to the soup will the cooking time make the cabbage too mushy? No, it shouldn’t get mushy. I’m in love with this soup! It looks amazing! I am so happy soup season is back!! I need a bowl of this soup asap. I was looking through Instant Pot Eats on Instagram and saw this soup. I made it tonight and it was so delicious. My husband says it’s the best thing I made in the Instant Pot so far. Outstanding! Had frozen meatballs on hand…great idea. Use whatever Tomato canned products you have on hand. Great meal with a salad on the side. I am kind of funny about meat. What brand of meatballs did you use? I used the Cooked Perfect Meatballs brand, very yummy! Oh my goodness, this soup is yummy ? 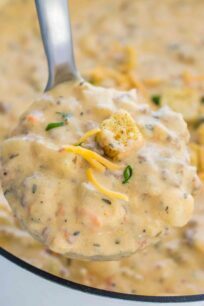 This is my favorite instant pot recipe so far! I added a little pasta the second time I made it and it was even better! Thanks so much for sharing it. This is a keeper. Other than the meatballs (luckily I had some in the freezer), this is pretty much a pantry recipe. As I didn’t want to go out in a blizzard, and had no marinara, I used a full small can of tomato paste and a small can of tomato sauce. Being lazy, I used a bag of frozen sliced carrots. I also added a little cayenne. Really good. I will make this again.